Cruise ships today are more reminiscent of floating carnivals than a means of transporting passengers from one port to another. Modern cruise lines spend millions of dollars advertising the ship (not the ports of call) as the vacation destination. Royal Caribbean’s and Celebrity’s cruise ships have FlowRiders, zip lines, rockwalls and ice skating rinks. Norwegian’s (NCL) and Carnival’s ships have water parks and slides. Cruise lines charge passengers additional fees to participate in these attractions in the increasing effort to make money. They, however, want to avoid liability if someone gets hurt. In an attempt to maximize profit and limit liability exposure, cruise lines started requiring passengers to sign releases of liability or waivers before participating in these attractions. In a blow to the cruise lines, the Federal Appellate Court for the Eleventh Circuit (the court that reviews decisions from the Florida, Georgia and Alabama Federal trial courts) recently held such liability waivers are unenforceable. This case involves a passenger who was injured while participating in Royal Caribbean’s FlowRider attraction. 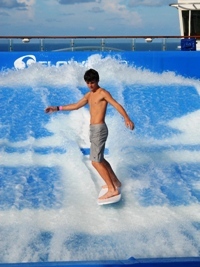 The FlowRider is a statutory wave that allows people to surf or body board in place while on the ship. Before Ms. Johnson was allowed to ride the FlowRider, Royal Caribbean required her to sign an “Onbroad Activity Waver” which released the cruise line and its employees from any liability “arising from any accident [or] injury. . . resulting from . . . [her] participation in any or all of the shipboard activities [she] has selected.” While waiting for her turn, the attraction’s instructor told Ms. Johnson to stand on the body board while he was holding it. This maneuver was in violation of Royal Caribbean’s safety guidelines for the FlowRider attraction. These guidelines specifically state that the boards for the surfing portion can be stood upon, while the boards used for the body boarding portion should only be used while lying down. When the instructor released the board, Ms. Johnson fell off and fractured her ankle. A personal injury lawsuit was filed in Miami, Florida which is where all passengers aboard a Royal Caribbean cruise ship must sue the company. The trial court analyzing the release found it enforceable and dismissed Ms. Johnson’s lawsuit. On appeal, a three judge panel unanimously found the waiver violated Federal Statute 46 U.S.C. § 30509 which precludes common ocean carriers such as Royal Caribbean from limiting their liability for personal injury or death caused by their negligence or fault. Based upon this finding, the appeals court vacated the trial court’s order and reinstated Ms. Johnson’s case against the cruise line. The impact of this opinion renders cruise lines’ liability waivers for injuries occurring on board their ships unenforceable. As a consequence, passengers who are injured while partaking in these on board activities have the right to bring their cases to court in order to obtain just compensation. If you were injured during an on board activity and have questions about your rights, feel free to contact our Florida Board Certified Admiralty and Maritime lawyers. Tagged: "Florida Wave Rider Law Firm", "Royal Caribbean Cruise Injury Attorney" and "Royal Caribbean Flow Rider Accident Lawyer"